Hello, and welcome to the fourth episode of the Software Carpentry lecture on software engineering. In this episode, we'll look at a software development methodology that many people feel is well suited to large, complex projects. Before the term "agile" was invented in 2001, this approach didn't have a name: it was just how big software engineering projects were run. Today, it's sometimes called "traditional" software engineering; fans of agile often call it "big design up front" (BDUF) or something less kind. We prefer the label "sturdy" because it puts a more positive spin on things. While agile is all about reacting quickly and taking advantage of opportunities as they arise, sturdy is about carrying the load of large projects—it emphasizes predictability..
Let's start by looking at what sturdy development isn't. 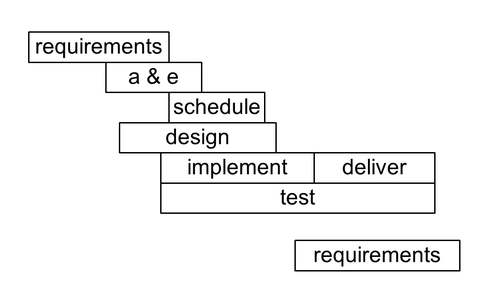 A waterfall model of software development divides the process into distinct stages; information flows from one stage to the next like water falling down a hill. Even in 1970, when this model was first given a name, people knew it didn't work. Nobody has 20/20 foresight; requirements are always discovered or changed as software is designed, while designs are re-done based on what's learned during implementation, implementations are modified as testing finds problems, and so on. The obvious implication is that time invested in up-front design can pay off many-fold if it prevents mistakes being made in the first place. It isn't always possible to do—people may not know what they want until they see something running, or tools may change so quickly that anything we design today will be obsolete by the time it's implemented—but very few programmers have ever said, "I wish I'd spent less time thinking about this before I started coding." The first step is to gather requirements, i.e., to figure out what the software is supposed to do. This is the product manager's job; while the developers are working on version 4, she talks to the customers about what they want version 5 to do. Crucially, she should never ask them what features they want in the software; that's up to her to figure out. Instead, she should ask, "What does it do now that you don't like?" and, "What can't you do that you'd like to be able to?" She collates these needs and figures out how the software should be changed to satisfy them. Only users who have logged in by providing a valid user name and password can upload files. The system allows users to upload files via a secure web form. The system accepts files up to 16MB long. The system accepts files in PDB and RJCS-1 format. The system converts files to RJCS-2 format before storing them. The system displays an error message page if an uploaded file cannot be parsed, but takes no other action. The next step is analysis and estimation. Each team member is responsible for analyzing and estimating one or more features. She has to come up with a plausible rough design, and estimate how long it will take to implement. Where possible, she should come up with two such plans: one for doing the whole feature, and one that obeys the 80/20 rule by providing part of what's been asked for with much less effort. Analysis and estimation presupposes some sort of overall design for the system as a whole. For example, it doesn't make sense to say, "We'll create a plugin to handle communication with the new orbiting mind control laser," unless the application has some sort of plugin system. If it doesn't, creating one is a task in its own right (probably a large one). We'll talk more about software architecture in a later episode. 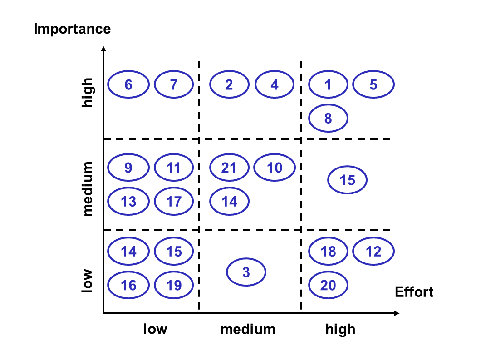 Once this has been done, it's easy to draw a diagonal line on the grid and throw away everything below it—after all, anything that's rated "high effort" but "low importance" isn't worth doing. Conversely, anything that's high importance and low effort definitely belongs in the plan. But then there are the diagonal boxes. Should the team try to do one important, high-effort feature, or tackle a handful of things that are less important but easier? Whatever they choose, it's critical that they don't shave their time estimates to make things fit. Yes, everyone wants to aim high, but promising something and then failing to deliver it on time is worse for everyone than be honest up front and saying, "We can't get that done." It's even more important that the project manager doesn't shave the developers' estimates. She's the person responsible for making sure things get built on time and to spec. One way to look at it is that the product manager owns the feature list, while the project manager owns the schedule. If she starts shaving or squeezing estimates, developers will start padding them. In response, the project manager will cut them back even more, until all the numbers are just so much science fiction. Lazy or timid developers can betray this trust by over-estimating, but even minimal time tracking will catch that sooner rather than later. Once the features have been picked, it's the project manager's job to assemble them into a schedule showing who's going to do what, and when. The real purpose of this schedule is to help the team figure out if they're late, and if so, by how much, so that they can start cutting corners early on. A common way to do this is to keep a burn-down chart, which compares the plan with reality on a day-by-day or week-by-week basis. If and when a gap opens up, the team can either figure out when they're actually going to be done, and move the delivery date back, or go back to the 3×3 grid to figure out what they can drop or scale back to meet the current deadline. This, by the way, is why it's useful to have people estimate both the full feature, and an 80/20 version. If and when time is running short, it may be possible to switch tracks and deliver most of the value with much less effort. The right time to think about this is the start of the project, when people are rested and relatively relaxed, not six weeks before a major conference deadline when tempers are already frayed. In order for any of this to work, developers have to be fairly good at estimating how long things will take. That comes from experience, but also from careful record keeping. Just as runners and swimmers keep track of their times for doing their favorite distances, good developers keep track of how long it takes to build X or fix Y so that they'll be able to do a better job of estimating how long the next one will take. In fact, whether or not a developer keeps track of their stats is a good way to tell how serious they are about their craft in an interview—something that would-be developers should keep in mind. Going back to the original timeline, you may have noticed that design overlaps estimation, and coding overlaps design. This is deliberate: as we said at the start of this episode, it's usually impossible to figure out how to do something without writing some throwaway code. 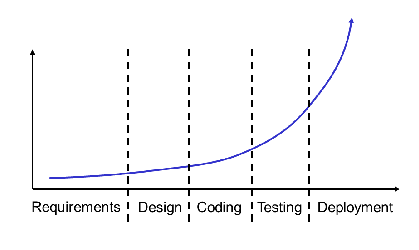 You may also have noticed that testing starts just as soon as development. This is critical to the project's success: if it is left until development is mostly done, it will inevitably be shortchanged. The consequences are usually disastrous, not least for the team's morale. In fact, the members of the team responsible for testing should be involved in the analysis and estimation phase as well. They should review every part of the plan to ensure that what the developer is planning to is testable. Anything that isn't should be sent back to the drawing board. Finally, notice that development stops well before the target delivery date. Ideally, developers should stop adding new code to the project about two thirds of the way through the development cycle, so that they can spend the remaining third of the time fixing the problems that testing turns up. As soon as they start doing this, or even before, the team should start "delivering" software by creating and testing installers, deploying it on a handful of servers, burning ROMs and putting them into the devices they're supposed to control, and so on. Packaging and delivery are often just as complex as the software itself, and leaving it until the last moment will once again usually have disastrous consequences. The two-thirds point isn't chosen at random. In all too many projects, that's when the high hopes that the team started with bump into the reality of over-optimistic scheduling, poor progress monitoring, and design decisions that weren't reviewed carefully, or weren't reviewed at all. The common reaction is to ask the team to buckle down and put in extra hours. This almost always makes things worse: as study after study has shown, human beings are only capable of about 40 hours of productive intellectual work per week. Anything more, and the mistakes they make because of fatigue outweigh the extra time they're putting in, so that the project actually slows down. Evan Robinson's excellent article "Why Crunch Mode Doesn't Work" summarizes the science behind this. For example, continuous work reduces cognitive function 25% for every 24 hours, which means that after two all nighters, your IQ is that of someone legally incompetent to care for themselves. The kicker is that, as with other forms of impairment, people don't realize they're affected: they believe they're still functioning properly. One of the key practices in sturdy development is the use of ticketing to keep track of work. Ticketing tools are often called bug-tracking systems, since they are often used to keep track of bugs that need to be fixed, but well-organized teams use them as a shared to-do list to manage all kinds of tasks, not just bugs. Every task is recorded as a separate ticket, each of which has a unique number, a one-line summary, its current state, and a longer description that may include screenshots, error messages, and so on. It also records who created it and when, and who it's assigned to. "You vill dream of pümpernickel" (with an umlaut over the 'u'). 2. Run the program with 'python mindcontrol.py --all --message accent.msg'. Program crashes with the message "No encoding for  on line 1 of 'accent.msg'". When Wolfman checks in the code that fixes this bug, and the tests for that fix, he changes the ticket's state from 'assigned' to 'closed'. If someone later discovers that his fix doesn't actually work, they can change the state from 'closed' to 'open' (meaning "we need to decide who's going to work on this") or 'assigned' (meaning "a particular person is now responsible for working on this"). More sophisticated ticketing systems allow people to record dependencies between tickets (such as "work can't start on this one until #917 is closed"), to estimate how long work will take, to record how long work actually took, and so on. They also limit who can change the states of tickets or assign them to particular people, which is one way to implement particular workflows. Another key practice in sturdy development is code review. As we said in an earlier episode, empirical studies have found that this is the single most cost-effective way to find bugs. It also helps spread understanding around in teams that don't use pair programming (which most sturdy teams don't). Generally speaking, code can be reviewed before it's committed to version control or after. Most teams prefer pre-commit reviews for two reasons. First, they prevent mistakes getting into the repository in the first place, which is better than putting them there and then taking them out. Second, if the team agrees that nothing gets committed until it has been reviewed, it's much more likely that reviews will actually get done. If changes can be committed, then reviewed later, that "later" may slip and slip and never come at all. But wait a second: how can the Mummy review Frankenstein's code before Frankenstein checks it in? Some teams try to solve this problem by creating one branch per developer, or per feature. The people working in that branch can check in any time, but review has to happen before code can be merged with the main line. Distributed version control systems like Mercurial and Git are particularly well suited to this kind of development, so it may be come more popular in future. For now, though, another common approach is for developers to create a patch. A patch is just a list of the differences between two sets of files, such as two different versions of the source code for a program. It also implicitly describes what has to be done to one set of files to turn it into the other, or vice versa. Developers can store their patches in the version control system, attach them to tickets, or submit them to a code review management tool like ReviewBoard. However they do it, someone else can then look at the patch, add comments, and give it back to the original developer. In large open source projects like Python and Firefox, it's common for patches to be reviewed and updated a dozen times or more before finally being committed to version control. Newcomers often find this frustrating, but experience shows that as projects become larger, "measure twice, cut once" pays off. So, is sturdy development right for you? Requirements are relatively fixed, or the team has enough experience in the problem domain to make estimation and planning possible. The team is large. If some team members aren't ever going to meet others, frequent course changes probably aren't going to be possible. Your customer insists on knowing well in advance exactly what you're going to deliver and when. Avionics software and control systems for nuclear power plants are extreme examples, but there are many other situations in which stakeholders genuinely do need to know exactly what's going to be ready to use this time next year. In practice, agile and sturdy development are more alike than their most passionate advocates like to pretend. Sturdy teams often use continuous integration systems and test-driven development, while agile projects often have an "iteration zero" in which they analyze architectural options and do large-scale design. That said, there are differences. For example, while both kinds of teams may use ticketing systems, agilistas tend to see them as a way to keep track of the work backlog, while teams using sturdy processes focus more on the workflow and responsibility aspects. In fact, what distinguishes successful teams and projects from unsuccessful ones isn't any specific set of practices, but humility. Most people would rather fail than change; good developers are ones who are willing to say, "What we're doing now isn't working, let's try something else." This doesn't mean jumping on every fashionable bandwagon that rolls by; instead, it means taking an honest look at what's going wrong, and being brave enough to try something new.